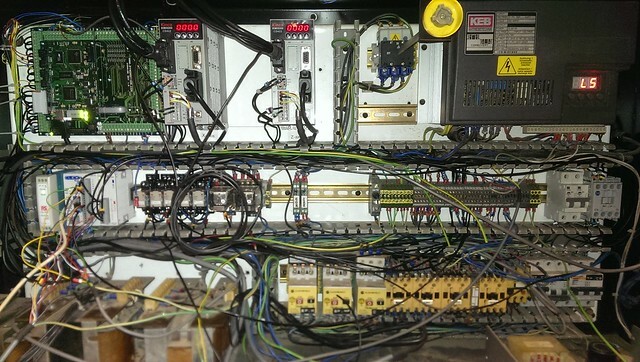 One of the Automation Direct Click PLCs. Originally picked them for cheapness, but miscounted the number of inputs/ouputs needed, so had to buy one of the additional IO modules. One feature I skipped over during the orignal decision to use a Click PLC, is the Kanalog has a connector designed to connect directly to the Click plus comes with sample code to talk to the Click. The order is late as apparently the courier has lost the last UK distributor order, so everything has had to be reordered. Have looked at the clicks and I know Brett used one on a changer, he was integrating for an oem, and he likes them. I know the DL06's so I tend to use them however on a new build I am helping a friend with (Beaver TC15 Lathe) there will not be a PLC for the toolchange as the controller will be the IP-A and thus checking the turret is where its meant to be will be easy enough. Is that Lamonde? They dont seem to stock much, everything seems to be ordered from the USA or at least thats the way it seems as it always takes at least a week before you get anything. The IO module finally turned up today. I've got it in and mostly wired up. The turret locked/thermal switches still need to be connected, and the Click to the Kflop (2 IOs and the serial cable), which I'm aiming to get done over the weekend. After that, the main thing left is dealing with all the programming. I need to get the ladder logic finished, finish tuning the servos, sort the C code for the KFlop, and get the KFlop talking to Mach. I'm considering switching the servos to torque mode, as most of the latest debates I've seen about Torque via Speed seem to say Torque gives better performace. Yes, I ordered the Click via Lamonde. I had to wait for the main module to come from the states aswell. I could of done the turret directly through the KFlop, however I would of had to make an interface board to make use of the low voltage inputs on the addtional header. I'm going to use the lathe as a bit of a test bed to see how well the KFlop works with a PLC for extending ins and outs, as I'm still undecided on how to handle the matchmaker as it's going to need a good bit more IO. I had been considering some custom arduino boards with modbus and 24V IO, but a couple Clicks may make life a bit easier. Nice machine and build! Waiting forward to seeing running. Yes 5v is a real PITA, had to do the same with the SS/ESS and use a PLC to get buttons etc into Mach, CSMIO solved all these issues for me and the IP-A is exactly what I had wanted for many years from Greg. Regarding torque v speed mode the debate has been going on for a long time and the favoured method seems to swing back and forth but from what I have seen all the main players use speed mode. If I get some time I may change the Chiron to torque to see if there is a difference, suppose the only way to tell which is better would be to see how low you can get the following error for a given set of parameters. I still need to tidy up the tool changer wiring as I just used the existing lengths to make sure it was all going to work, and deal with all the other loose odds and ends like getting all the wiring into the trunking. I've just remembered I still need to find out why the spindle encoder isn't outputting the B pulses. After several hours trying to figure out the ladder logic for the turret, I have come to the conclusion I hate ladder logic. I can appreciate it's uses, but what could take a couple lines of reasonably simple code in a microprocessor, takes far too many rungs and holding variables and contacts. Plus it's a nightmare to move things around when you need to change things. I'm probably not helping myself by programming for the turret to spin both directions, but even the locking for one direction gets a bit complicated. I still need to add a couple additional timers to trigger a fault and disable the motor/solenoid if the turret fails at any point during the move. The annoying thing is, I got an email from Dynomotion this morning telling me all about their new Konnect IO expanding board, which would of given me more than enough IO to handle what the PLC is handling. If only it had of been available a couple weeks ago when I ordered the PLC! Only thing I'm not too keen on is the price of the Konnect as it's $199, which puts it at roughly twice the price of a CS IO module for an identical number of IO's. Just looked at the Konnect and it has double the I/O of the CS-Lab module so not so expensive, actually a bit cheaper.